The Goods Line, Sydney, is urban renewal at its best. Transforming a long-abandoned freight railway line into green space, this formerly dead part of town now draws city workers outside and creates an attractive walkway between Central Station and Darling Harbour. The Goods Line, Sydney. Image: Sydney Coast Walks. This area was my former stomping ground (I’m ex-ABC and UTS, both of which back on to the Goods Line) except there was no stomping. There was nothing here. So even for a local – especially for locals – it’s an amazing transformation. And for visitors, feel free to take for granted how green it all is, how many cool cafes are nearby, how you can stroll past Frank Gehry-designed buildings as if, like, all of Sydney is this green and open and cool. How Hard is the The Goods Line Walk? Grade 1: no bushwalking experience required. Flat even surface with no steep sections. Stairs at one end, with alternate ramp access. Paved walkway with limited signage. Designed as a pedestrian walkway between Central Station and Darling Harbour, access to the Goods Line is well serviced by trains and buses. No drinking fountains available. For the nearest, try the City of Sydney’s map of water bubblers. There are public toilets at either end of the walk, found within Central Station and at Darling Harbour. This is an urban walkway in the centre of the city, so has reliable mobile phone / cell reception. The Goods Line can be walked in either direction. Try starting at Central Station in order to spend more time at Darling Harbour, the destination. Alternatively, use The Goods Line to scoot back to Central after a day at Darling Harbour. The Central Station end is fairly unimaginative. Railway lines embedded in the concrete at your feet are the only indication you’re walking on a former freight rail line that first opened in 1855. The Goods Line. Image: Sydney Coast Walks. However, walking across the railway bridge reveals its promise of purposefully designed public space. Fig trees provide shade over ‘study pods’ cantilevered over the street below. There are ping pong tables (bring your own bat and ball), bright yellow communal tables and an informal amphitheatre space. Standing over the space is a striking building often described as a “crumpled paper bag”. It’s the Business School of the University of Technology Sydney. Officially titled the Dr Chau Chak Wing Building after its major donor ($20 million, thank you very much), it’s designed by renowned US architect Frank Gehry. It’s the first Gehry-designed building in Australia. You should see the quick hand-drawn sketch of Gehry’s first imaginings of this unique building. The Frank Gehry-designed university building backing on to The Goods Line, Sydney. Image: Sydney Coast Walks. The Goods Line blends heritage and former industrial uses in its design. An 1853 sandstone culvert found during work on a nearby cable tunnel was re-erected along the walkway. Mary Ann Street Culvert. Image: Sydney Coast Walks. There is also an old railway signal box and interlocking machine. A nod to The Goods Line's industrial past. Image: Sydney Coast Walks. The Goods Line from Sandfly Film Festival on Vimeo. It’s easy to say, “start from Central Station”. But like other cities’ main train hub, Central Station is big. From within the station, aim for the Devonshire Street Pedestrian Tunnel. See more details under Public Transport below. At the Central Station end, the walk starts at the Lee Street end of the Devonshire Street Tunnel. If you’re not coming from within the train station, start from the end of Thomas Street (near the Novotel Sydney Central). Looking towards the Central Station end of The Goods Line, near the rear entry to the ABC. Image: Sydney Coast Walks. If you’re at the Darling Harbour end, head for the southern end of the International Convention Centre (ICC) and the Chinese Garden of Friendship, and keep walking. It’s nicer to then turn right into Steel Mill Lane, then left on to Darling Drive briefly. The Goods Line starts across the road. Being in the centre of the city, parking can be expensive and traffic tricky. Conversely, it’s easy via train or bus from Sydney’s centre and surrounds. If you catch a train, the Devonshire Street Tunnel can be found via the Southern Concourse, right near the escalators to the blue Illawarra Line (Cronulla / Bondi Junction). (Or from street level: Chalmers Street). Walk to what feels like the end of the pedestrian tunnel, where it opens up to the bus interchange. Don’t go up to street level; keep going to the tunnel’s actual end. You’ll pop out looking at the back of a UTS uni building. This uninspiring view at the very end of the pedestrian underpass actually means you're in the right place. 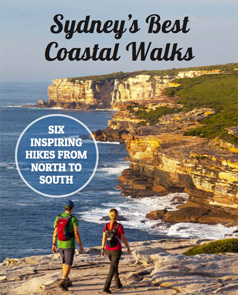 Image: Sydney Coast Walks. From here, there’s no other way to go except to turn right. Looking down, you’ll see old railway tracks in the concrete. This is the start of the Goods Line. If you’re in the city itself, a bus may be better. Get off at Railway Square. Make sure you go below street level (on the [eastern] Central station side of the road) to join the very end of the pedestrian underpass (heading away from Central Station). Whether arriving by train or bus, take the pedestrian path underneath George Street. Image: Sydney Coast Walks. You’ll see the back of a UTS uni building. Turn right and keep walking because you’re now on The Goods Line. There’s a private parking station on Thomas Street near Novotel Sydney Central. Come out of the parking station, turn left as if you’re going to walk into the back entry of the ABC, then turn right to the pedestrian walkway that is The Goods Line. There are plenty more parking stations around Darling Harbour. Do a quick internet search. There are often weekend deals, and it’s often cheaper to park all day (arriving and leaving between set times) than to park for a few hours in the middle of the day. Wedged between Chinatown and Darling Harbour, there are so many places to eat it may be hard to decide. But to keep close to The Goods Line – and the spirit of “I didn’t know Sydney had this space!” – try Steel Mill Lane, part of the emerging Darling Square. Sydney's new Steel Mill Lane is worth a visit. Image: Sydney Coast Walks. You could also try the Powerhouse Museum's cafe, especially if you want to grab takeaway to plonk yourself down on some of The Goods Line's grassy areas. The cafe overlooks the walkway. The Goods Line ends at the rear of the Powerhouse Museum. Image: Sydney Coast Walks. Discover more of the city's green spaces and iconic sights on the Sydney City Walk.